Billy Heath admitted his FC Halifax Town side did not do enough to secure all three points against a Torquay United outfit with only one win to their name all season. In a scrappy 1-1 affair, on a miserable and damp afternoon at The Shay, Heath had debutant George Waring to thank for breaking the deadlock after 68 minutes. But Town’s lead lasted only eight minutes as Jamie Reed secured a point for the visitors after Rhys Murphy’s header had hit the post, leaving Heath to acknowledge that a draw was a fair result. “I don’t think we did enough to win the game,” Heath said. “It was a pretty even game and it wasn’t the greatest game in the world but we managed to get a point. We were a little bit off the pace. “It was disappointing that we got in front and we couldn’t see the game out. “The bigger disappointment is that we conceded from a set piece because we are a big enough side. The team is physically big enough not to concede. “That goal summed us up a little bit - we didn’t win enough of the second balls. Waring showed a true striker’s instinct to pounce from within the six yard box, after the Gulls’ defence had failed to deal with a long Connor Oliver free kick, to seemingly set Town on their way to a valuable victory. Heath was pleased with the loanee’s immediate impact and contribution. He said: “I am pleased for George that he managed to get a goal. It was difficult as he hadn’t trained and I only met him this morning. “We did it on Friday. It took a while to get it done but we got there. “As for a debut, I thought he was fantastic as it was a great all-round performance and he topped it off with a goal. “The boy did very, very well and it is all credit to him because it is difficult when you haven’t met any of the players. “It was a very good debut for him. He led the line well, he’s got nice feet and he brings people into play. 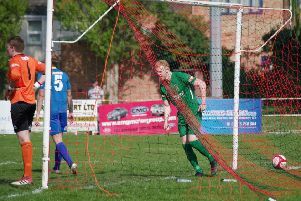 Waring’s strike, however, was soon cancelled out by Reid, who had signed permanently for Torquay earlier in the week, and the point was enough to lift them off the bottom of the table. The Town boss praised Gary Owers’ men, saying: “If you have actually watched Torquay this season then you will know that they have played some good football and have been getting beat by the odd goal. “I knew what was coming. We know in this league that you have got to be really, really at it in every single game that you play. We never really flowed and we never really got any rhythm going but we will take a point. “There were patches where they had the play and there were patches where we had the play but once you get your nose in front, especially when the game isn’t flowing, then you have just got to shut the game down.